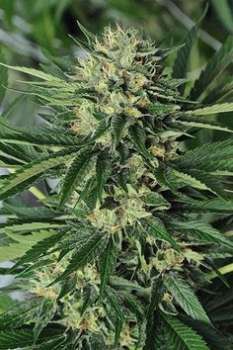 Here you can find a strain description about Pine Tar Kush and also some user-based reviews and infos directly from the SeedFinder (if available). You can also find the offers and auctions here if Pine Tar Kush cannabis seeds are on stock at MyCannapot right now. Pine Tar Kush (IBL) is one of the heavier yielding pure Indicas. This line (Tom Hill release) was brought back from Pakistan in the early 1980's and is aptly named for its wood-flavored terpenes and tar-like buds. PTK averages 20-24% THC and may be good for chronic pain, cramps, depression, gastrointestinal disorder, inflammation, insomnia, loss of appetite, muscle spasms and PTSD Indoors It takes between 7 to 9 weeks for Pine Tar Kush to fully flower. Once ready, it yields an average of 10 to 12 ounces of buds per square meter. Outdoors Pine Tar Kush usually blooms by the last week of September. However, the flowering period can extend up to the second or third week of October. Regardless, it produces at least 12 ounces of buds per plant. Pine Tar Kush is great for pain relief, insomnia, gastrointestinal issues, AIDS, stress, and ADD. Also good for PTSD. Fowering period is 7 to 9 weeks. Buy Pine Tar Kush now at MyCannapot! There are no actual running auctions for Pine Tar Kush right now.